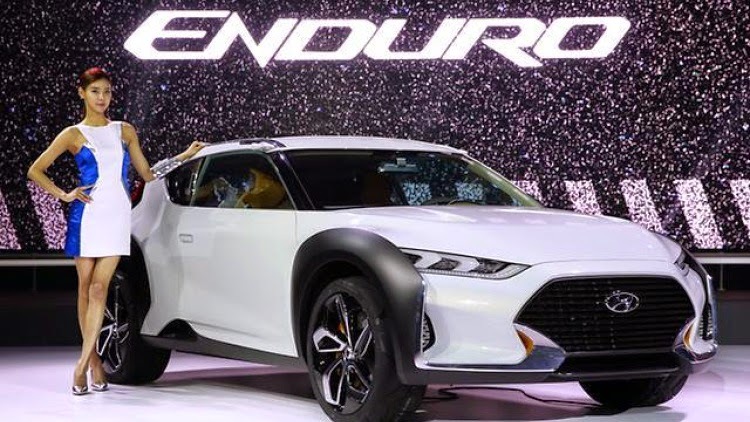 From the Seoul Motor Show 2015 event, Hyundai HND-12 Enduro Concept ongoing makes its world debut and conceptualized as a Concept Crossover Utility Vehicle (CUV). The name "Enduro" is taken from Endurance. While the exterior design of this concept is a blend of SUV with a rally motorcycle. Hyundai Enduro is designed to be a partner for those who live in a modern city with an energetic lifestyle. Its face was expressive with dashing pattern. Front fascia with a hexagonal grille slats (aero blade) that connect to the aluminum front fenders. The main light looks unique with the LEDs combination. Pillar C equipped with water-unique blade to reduce wind resistance. Side skirts incorporated by stepping aside to allow you to install/remove objects from roofrail.